I was asked to preach this morning on John: 20:19-31, which recounts the tale of St. Thomas and his moment of doubt (I refuse to call him "Doubting Thomas" because I don't believe that one incident defines him as a character). A defendant was on trial for murder. There was strong evidence indicating guilt, but there was no corpse. In the defence's closing statement the lawyer, knowing that his client would probably be convicted, resorted to a trick: "Ladies and gentlemen of the jury, I have a surprise for you all," the lawyer said as he looked at his watch. "Within one minute, the person presumed dead in this case will walk into this courtroom." The jury, clearly confused, retired to deliberate. A few minutes later, the jury returned and pronounced a verdict of guilty. "But how?" inquired the lawyer. "You must have had some doubt, I saw all of you stare at the door." The jury foreman replied: "Oh, we looked... but your client didn't!" A couple of years ago I preached about Thomas and defended him as a passionate man who despite his moment of doubt, was a person who clearly deeply cared about Jesus and a man who we could all relate to. However when I read the passage in preparation for this morning, I was struck by how Thomas's experience and the manner in which he expresses his doubt is especially relevant to our world today. Throughout history, people have had doubts about the resurrection of Jesus... But today we live in an age where for many outside the church, cynicism has been superseded by passionate and zealous unbelief. Some share the thinking of certain prominent critics of the Church that something cannot be believed without empirical evidence. I felt that these demands very much echo the words and attitude of Thomas when he meets the disciples following their encounter with the risen Jesus. Thomas didn't merely say "I can't believe" or "I struggle to believe"; Thomas declared "UNLESS I SEE... I *WILL NOT* BELIEVE". He was adamant! Usually when we see this part of the gospel performed in a play or a film, no sooner has Thomas uttered the words, then a great shaft of light breaks into the room and Jesus stands before Thomas. However if we read the text, we see that an entire week passes before Jesus is seen again. It makes you think, doesn't it? God doesn't always answer our doubts immediately... sometimes he gives us time to reflect on what we say and feel. What is important here, is that although Thomas and the other apostles were in different spiritual places... they didn't disassociate themselves from one another. Thomas didn't dismiss his friends as crazy and disappear never to be seen again; for their part, the apostles bore with Thomas as he struggled to deal with what he must have considered to be outlandish claims. I think there's a lesson for us all there, wherever we are. If we are struggling... don't give up. If we see our friend struggling... don't walk away from them just because they are on a different page. Isn't there a subconscious temptation to move towards a subtle parting of the waves when we gradually learn that a friend is moving in a somewhat different direction that disappoints us? If so... we should learn to wise up to it and resist its pull. "*Put* your finger here; *see* my hands. *Reach out* your hand and put it *in* my side". The wonderful thing about Jesus' response to Thomas is how accommodating he is. Last week we read how in the garden, Jesus asked Mary Magdalene not to hold on to him as he had not yet ascended to the Father. Yet here Jesus not only invites Thomas to observe his wounds, but to actually reach out and touch them in an intimate way. It shows us that when Jesus meets us at our point of need, he is selfless and personal. It does not matter to him how much it might cost, hurt or inconvenience him... he us wiling to offer his life and his wounds that we might believe and have life. But the thing I feel most burdened to write about this morning, is how we are to witness to those who have that passionate disbelief about the nature of Jesus, as represented by Thomas. The Holy Spirit is like the defence lawyer in that joke. Now I'm not saying that the Holy Spirit is lying about the resurrected Jesus, far from it. What I am saying is that the Spirit prompts the people of the world to look to the idea, the reality of Jesus being alive. Yet so often, it's when people look back at us as his followers in the dock that their decision as to whether or not they are willing to believe is influenced. If we aren't looking to the return of the resurrected Jesus, if we aren't living a life that acknowledges the resurrection in some way... do we not falsely make out to other that the Spirit lies? Habeas Corpus. Can we present the body of the risen, living Jesus to the passionately disbelieving? One day, whether it's tomorrow or in a million years, the Bible tells us that Jesus will walk through that courtroom door... every eye shall see. The people asking the question will have their empirical evidence. But what use is it to them then? In order to have life, they need to know it *now*. While we don't necessarily bring empirical evidence to people's lives, by our words and our actions we *can* demonstrate Christ alive and at work in us. We need time to pause and reflect in God's presence... to breathe in the Holy Spirit and let God permeate our beings. We also, when talking with people about God, if they get angry with us, need to do our best not to lose the peace God bestows on us and turn our conversations into verbal fire-fights. This is especially important in the Internet Age, where what starts out as well-meaning debate so often descend into a vitriolic slanging match. Secondly, we need to let that peace, that sense of God's presence, develop our discipleship. The Acts 4:32-35 reading today encourages us to be one in heart and mind. Serving and loving God and one another in such a way that his grace works in us powerfully and testifies to the resurrection. "Christianity without the living Christ is inevitably Christianity without discipleship, and Christianity without discipleship is always Christianity without Christ." If we breathe in the Holy Spirit in moments of peace and breathe out the Holy Spirit through our discipleship, the living Christ becomes evident to those around us. Finally, we should allow God to use the marks of our own wounds to witness to others. Jesus said that as the Father sent him, He sends us. The Father sent Jesus in frailty to be one of us. 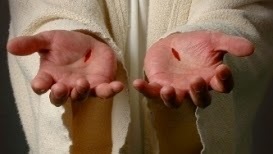 When Thomas required physical proof of the resurrection, Jesus allowed him to touch his wounds. Similarly when we see people struggling in faith with something we've been through, we should seek to show our empathy and demonstrate that although God may sometimes allow us to experience hardship, he does walk beside us and lead us through it. Let those who suffer see the marks of our own spiritual testimony.